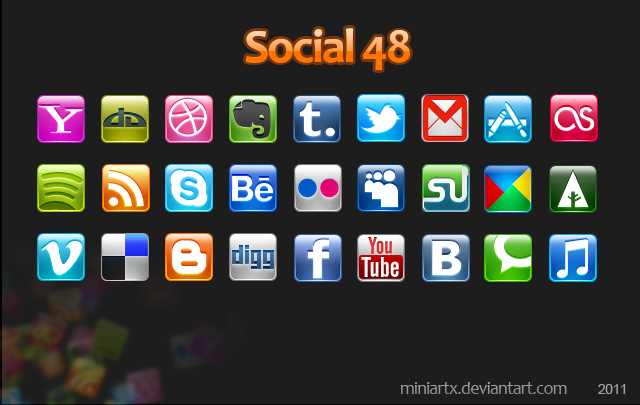 Designed by Miniartx, the set contains shiny metallic social icons including Facebook icon, Twitter icon, You tube icon, RSS icon, Delicious icon, StumbleUpon icon, Digg icon and many more. For commercial use, please contact the designer. This Article Has Been Shared 5450 Times! Social network icons in glossy square style is here for your free download. Twitter icon set of metallic cut out style with different background colors is here for your free download. Cite this article as: Abhishek Ghosh, "Shiny metallic square social icon set," in The Customize Windows, March 30, 2011, April 25, 2019, https://thecustomizewindows.com/2011/03/shiny-metallic-square-social-icon-set/.